I had the great pleasure of participating in the seventh future environmental trends conference organized by Institut Veolia in Washington DC on 29 and 30 May 2014. 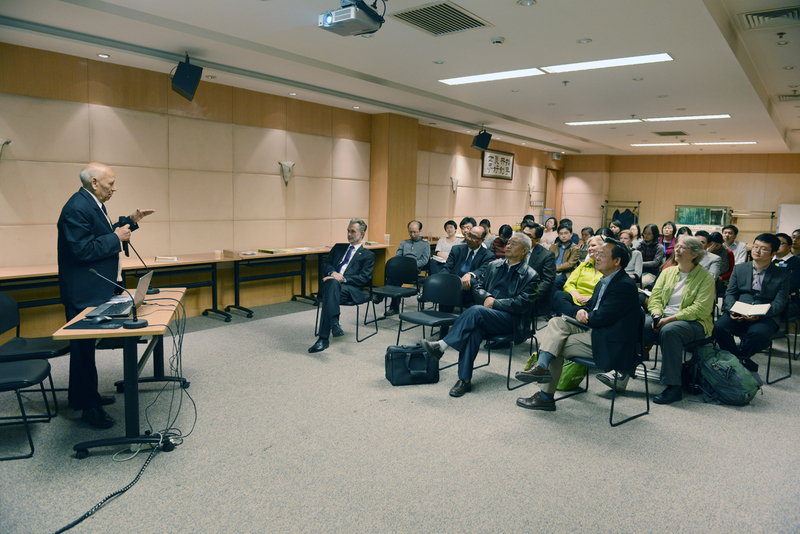 The conference was titled: “Ecosystems, economy and society: how large scale restoration can stimulate sustainable development”. Andrew Steer from the World Resources Institute asked if it was time for a “Revolution for Conservation” as there is 2 billion hectares of unproductive land around the globe. Dennis Garrity from the World Agroforestry Centre (ICRAF) had made a plea the previous day for a green revolution for Africa, promoting agro-forestry throughout the continent. Most bamboos are giant grass species, which occur throughout the tropical and subtropical belts. While bamboo is often associated with the Asia-Pacific Region, there is large area of native bamboo in Africa and in Latin America. There are more than 1400 species of bamboo, and they range from relatively small plants to giant culms. 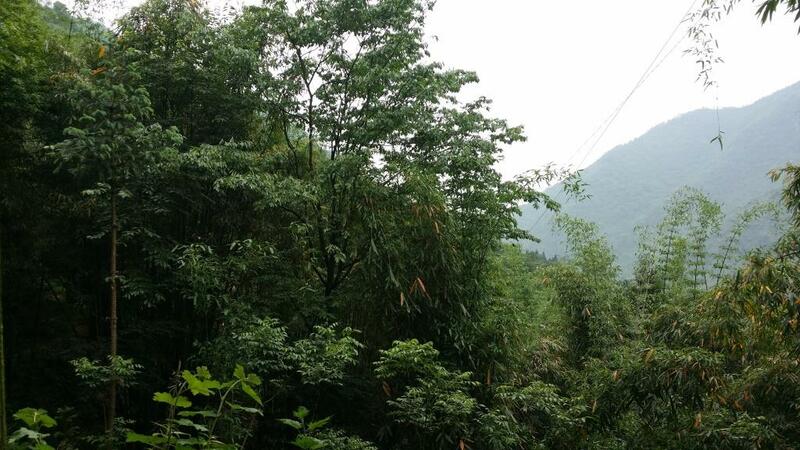 Bamboo naturally grows in between other species in a mixed forest, although some of the industrial bamboo plantations in China are mono-culture. Bamboo requires rainfall of at least 500mm per year, but thrives in wetter conditions and different species are adapted to their local conditions, based mainly on rainfall, temperature and soil conditions. Bamboo grows very fast. In spring or the rainy season, new shoots appear above ground, which reach full height and diameter in several months. The growth rate can reach more than 1 metre per day. Once the bamboo stems (culms) have reached full height, they will not become bigger, but they will need 3 to 5 years to reach maturity, when they can be cut for use. As bamboo is a crop, it can be cut year after year, and new shoots will re-appear to replenish the stock of culms. There are in general terms two types of bamboo – clump bamboo (sympodial) usually in tropical areas and running bamboo (monopodial) in subtropical areas. A third variety is a hybrid between the two. Clump bamboo grows from a central root mass, and does not spread. Running bamboo has rapidly growing rhizome and root systems, which can grow 1-5 metres in a year. The rapid growth and the strong root systems make bamboo particularly suited for soil protection. It is reported that a single bamboo plant can bind up to 6m3 of soil and research in China showed that soil erosion in a bamboo plantation is 4.7 times lower than in adjacent sweet potato cropland. Rwanda has a national bamboo policy that specifies the objective to reduce soil erosion, siltation of rivers and water bodies by growing bamboo on slopes and buffer zones along riverbanks and lakeshores. Together with the ministerial order on buffer zone management, Rwanda has a practice to plant bamboo along ten (10) and five (5) metre corridors along big rivers and small rivers. Similar arrangements are in place in other countries. For example, Dendrocalamus hookeri was planted along the Mahaveli river in Sri Lanka, and bamboo is also planted along rivers in Brazil, China and other countries. The Philippines National Greening Policy states: Bamboo and mangrove species shall also be tapped as reforestation crops, particularly in river banks and coastal areas, to control soil erosion and as buffers against wave action.” One project in Las Pinas is planting bamboo along 58 kilometers of its riverbanks, using the Philippine giant bamboo, scientifically known as Dendrocalamus asper and the Bambusa blumeana or what is commonly known in Filipino as kawayan tinik. Bamboo is also used to help restore degraded lands. In India, INBAR worked with a local NGO Utthan in Allahabad, where a large area of land had been used for decades as a source of clay for brick-making. Introduction of pollution control measures and changes in rural development resulted in the collapse of the brick-making industry leaving local communities destitute. Bamboo was used in a pilot project of just over 100 hectares in 1997 and after a number of years, the red earth had been changed into a green oasis. The pilot project ended some ten years ago, but the planting efforts have not ceased. In fact, the result of the initial investment has been that more than 85,000 hectares of degraded land have now been made productive again, helping 90,000 local households. The initial project was so successful that Utthan was awarded the UDS1million Alcan Prize for Sustainable Development in 2007. The economic benefits are enormous, and indirectly, the bamboo cultivation has resulted in local energy provision, better living conditions, fodder for livestock and poultry, a source of useful materials and therefore income for local communities. Other villages in India have copied the successful approach in Allahabad, and 3 hectares of barren sodic soils in Madampoondi, Villupura, have been turned into a green forest in one year. Similarly, bamboo is used as a means to help restore eroded slopes in Chili and in Brazil. In Ghana, tests were carried out to assess the suitability of bamboo for restoring degraded mined areas in the Ashanti region, and providing economic opportunities for the surrounding local communities. Some reclaimed mining sites were used in the research, and some areas that were untreated former mining terraces.After ten months, the space between individual plants had almost closed, and it was difficult to measure individual plants. The survival rate of all species was 95%. Not surprisingly, native species were very suitable, but also an exotic species was considered particularly well suited. In China, large areas of forested land were cut during the last century in order to make space for agricultural development. This has turned out to be a challenge in several areas, and more recent policies of Government have promoted the conversion of marginal agricultural sloping land into forest land. In those provinces where bamboo is the major native species, the restoration has been done with bamboo species.In 1999, the Central government set up piloting sites in Sichuan, Shaanxi and Gansu provinces to seek the pathway for conversion of farmland to forest and grassland countrywide. From 1999 to 2011 the programme has been adopted in 2,279 counties in 25 provinces, involving 32 million rural household and 124 million farmers. The total conversion area is 28.94 million ha, including a) conversion into forest 9.26 million ha, b) plantation of bamboo and trees in waste land and mountains 16.98 million ha and c) mountain enclosure for forest rehabilitation 2.7 million ha. The total financial input from Central government during this period has been 438.5 billion Yuan, which is nearly 70 billion US Dollars. About 12 bamboo species such as Phyllostachys pubesence and Dendrocalamus farinosuswere selected as priority species by farmers in 13 provinces where bamboo was used in the reforestation programme. In Sichuan Province, bamboo was used to restore the fragmented habitat of the Giant Panda. Due to agricultural expansion, unplanned landuse and development pressures, the former bamboo habitat of the Giant Panda has been fragmented and reduced. Grain for Green project and a landscape restoration programme in response to the 2008 earthquake provided resources to re-engineer the landscape and restore the bamboo habitat. The two photos above show the landscape around Xiakou village, Yaan County, Sichuan, China before planting in 2002 and afterwards in 2010. Photos by Yang Hanmei. Bamboo has more recently also been planted as a means to create a carbon sink. Bamboo absorbs as much CO2 as a woody tree, and research in China has indicated that in comparison bamboo is a better CO2 sink than Chinese fir- one of the fast growing sub-tropical tree species. The China Green Carbon Foundation planted 47 Hectares of barren land in Lin’an County, Zhejiang Province, China in 2007 with Phyllostachys pubescens. After just five years, the site was covered in bamboo, and Alibaba company paid USD30,000 on 1 November 2011 to buy the 8155 ton CO2equivalent generated by the plantation. As bamboo is a grass species and not a tree, planting bamboo will help countries reach their REDD+ targets, while harvesting bamboo does not contribute to deforestation. 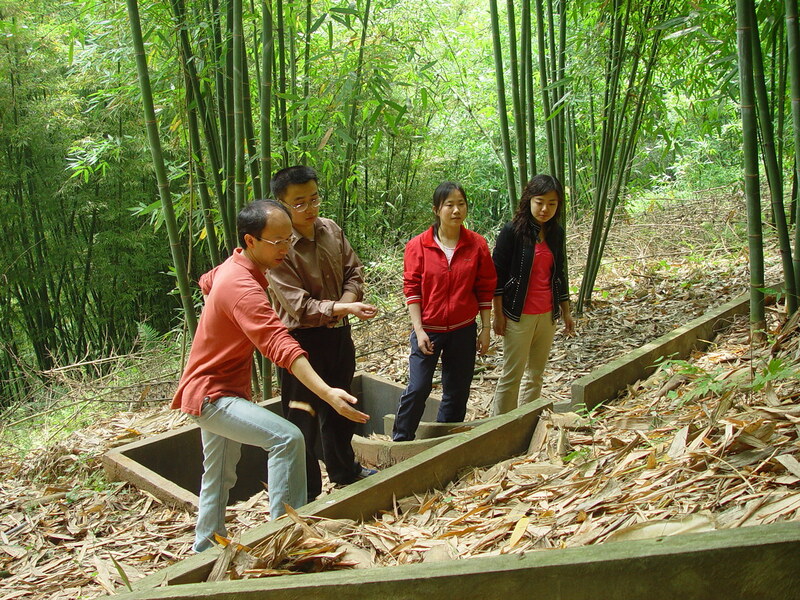 Cut bamboo can also play a role in erosion control and landscape restoration. In Ethiopia, local research found that check dams constructed with a frame made of local bamboo mats are much cheaper than gabion check dams. The bamboo ones work best in small gullies in the uppermost parts of the catchments. 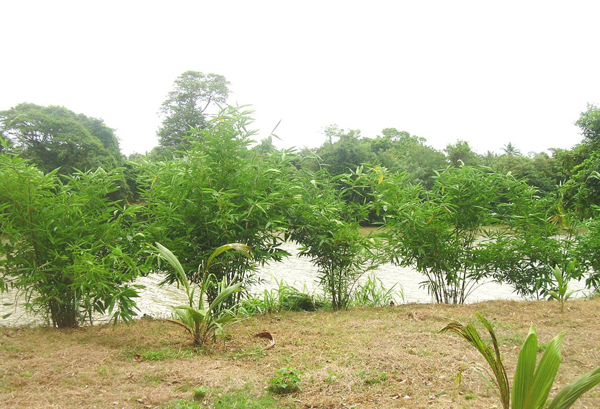 In the main valley, where there is risk of violent flash floods, the bamboo check dams cannot be used. Another interesting example of landscape restoration with bamboo comes from Thailand. Along the coast of Kok Kham island, bamboo breakwaters and bamboo fencing have been used to reverse coastal erosion. 3″ diameter and 5m length bamboo (Dendrocalamus asper) culms were used to build walls on the coastal mudflats, up to 4m above ground. The bamboo structure dissipates the wave energy and reduces wind velocity near the coast, and causes deposition of silt with an average 0.46m/year while there is loss of sediment in the neighbouring area without similar structures. 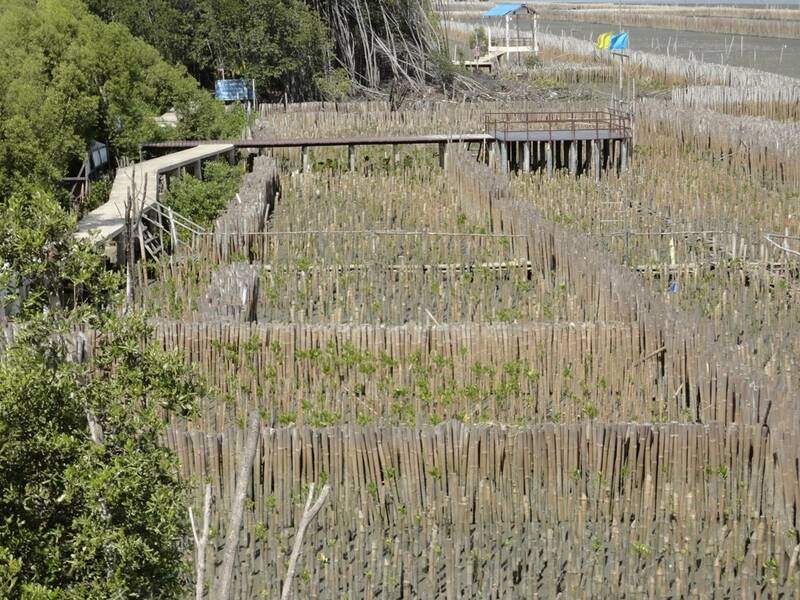 The deposited sediment has a lot of food nutrient which is suitable for recovery of mangroves, and the bamboo walls therefore enable mangrove restoration to take place more effectively. All this illustrates how effective and useful bamboo can be in repairing degraded land and restoring ecosystem functions. The added advantage of including bamboo in restoration initiatives is the fact that it can be used for many purposes. There are reportedly 2000 different uses of bamboo products, ranging from pulp and paper to textile, from food to a source of renewable energy, and bamboo is a versatile construction alternative to wood. Yesterday, we had a visit by D.N. Tewari. He is an Indian specialist with a distinguished career in forestry management. 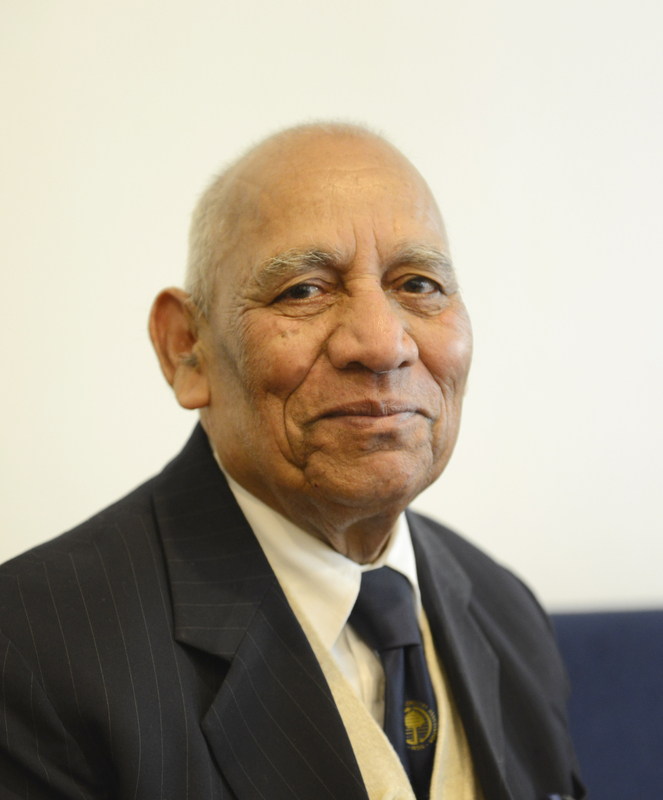 He was the first Director-General of the Indian Council for Forestry Research and Education, former member of the Indian Planning Commission, former Trustee of ICRAF – the World Agroforestry Centre, former Member of FAO working group on biodiversity and much more. Dr Tewari is also the Founder and Director of Utthan, Centre for Sustainable Development & Poverty Alleviation. INBAR and Utthan developed a project some twenty years ago in an attempt to help local communities near Allahabad who were living on totally degraded soils in an area that had been devastated through years of brick making. The brick-making industry had come to a halt, and the soils were so bad that there was no opportunity to grow crops or make a living. Natural regeneration of the historical tree cover would take tens of years, so the plan was hatched to use bamboo as a means to speed up the process of ecosystem regeneration. This was the start of the “Greening Red Earth” project that has been described in an INBAR report from 2003. We are returning to the project area later this year to review what has happened since, and to be able to record the development, but Dr Tewari told us yesterday in broad terms what the impact of the project has been: In 15 years, some 90,000 hectares of mined soil has been rehabilitated in the project area, but similar work elsewhere by Utthan and its partners has resulted in upgrading of millions of hectares of degraded lands. Side effects of the projects have also included literacy classes for the workers in the nurseries, access to vaccination and sanitation and general improvement of the living condition of nearly 1 million households. The project is a case study of a success story, but there are new challenges, and Dr Tewari listed the following as areas where INBAR could help. There is lots of money available for rural development, but most of it is locked up in large funds with institutions that require project proposals to access the funds. Local communities have limitations in project formulation and writing of proposals. Training by local organisations like Utthan is critical, and INBAR should liaise with in-country expertise to facilitate this. International trade in forest products is regulated through certification and standards. Bamboo and rattan are often treated as a tree product, leading to unnecessary red-tape. There is need for awareness and education both in producing countries and in the countries that import bamboo and rattan. There has been some exciting field work in the past years, but a lot is hidden in project reports, local language research papers, or institutional archives. We need more publications to illustrate the benefits of bamboo and rattan and to document the progress that has been made in developing the resources sustainably. INBAR should take the global stage and talk about the values and benefits of bamboo and rattan so that those outside the traditional bamboo community will learn and understand what the opportunities and challenges are for bamboo and rattan producers. Promoting adaptive research and on-the-ground innovation by helping to establish pilot best-practice case studies and supporting up-scaling of successful practices across the INBAR Member countries.